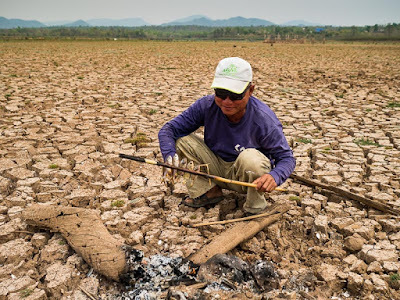 A man grills fish on the dried out bed of the Mae Chang Reservoir in Na Sak, Lampang. This reservoir should have more than six feet of water in it but is completely dry. 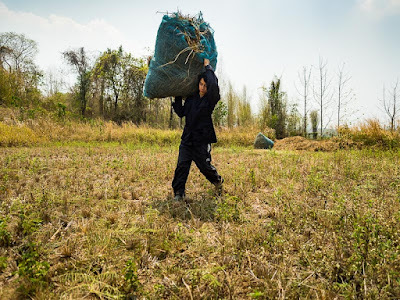 I came to northern Thailand to work on stories about the drought. 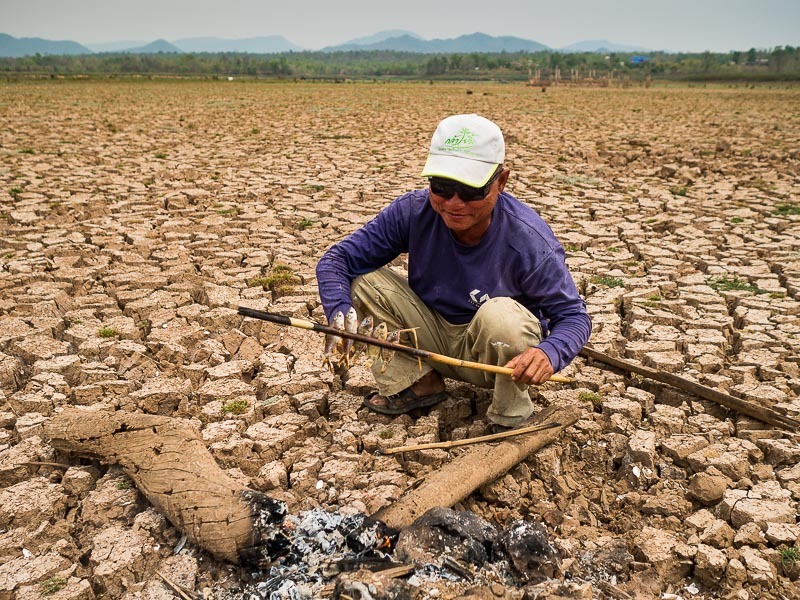 Thailand, and all of mainland Southeast Asia, is in the midst of a record breaking drought. 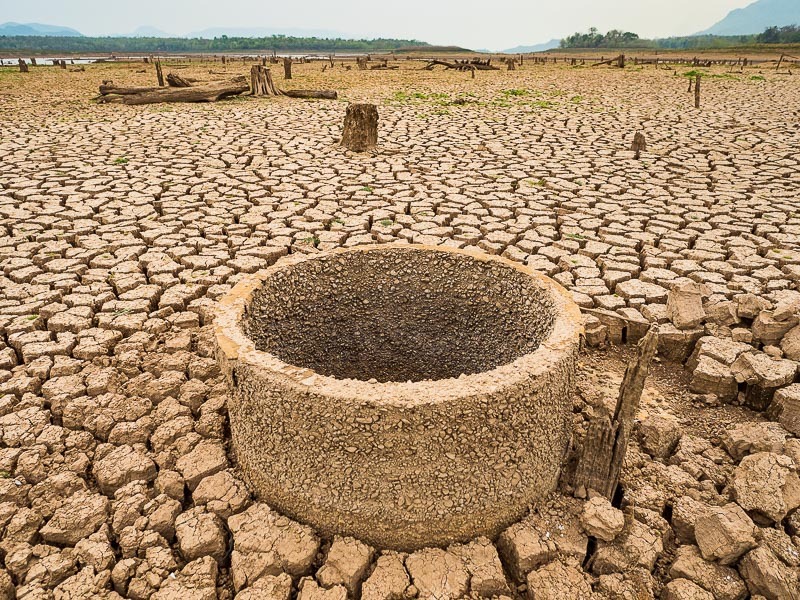 Reservoirs and irrigation canals in central Thailand are essentially empty. The situation in northern Thailand, around Chiang Mai and Lampang provinces, is extraordinarily bad. The Mae Chang Reservoir, which was built in the early 1980s, is empty. Villages submerged when the reservoir was flooded are visible again. Some have turned into tourist attractions of sorts because people displaced by the flooding are coming back to their old homesteads. 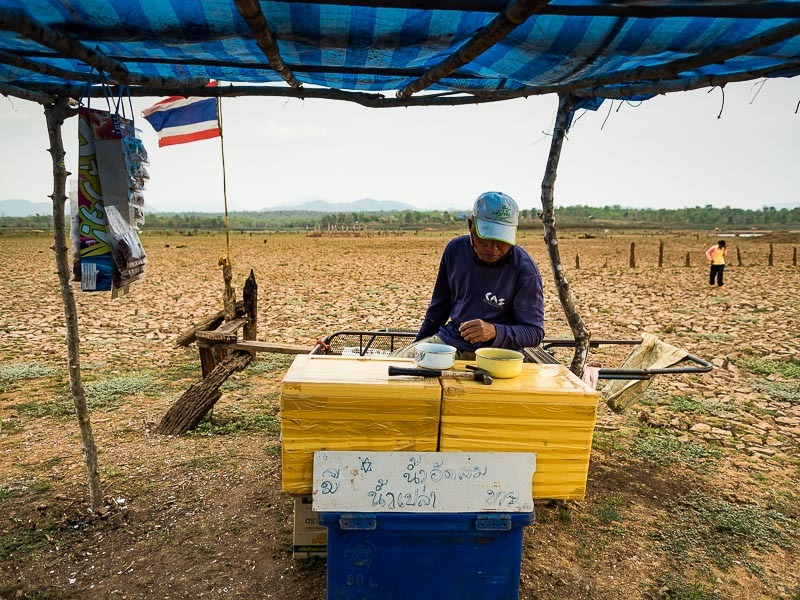 A vendor sits under a small shelter he built waiting for tourists to come to the ruins of a Buddhist temple in the reservoir. 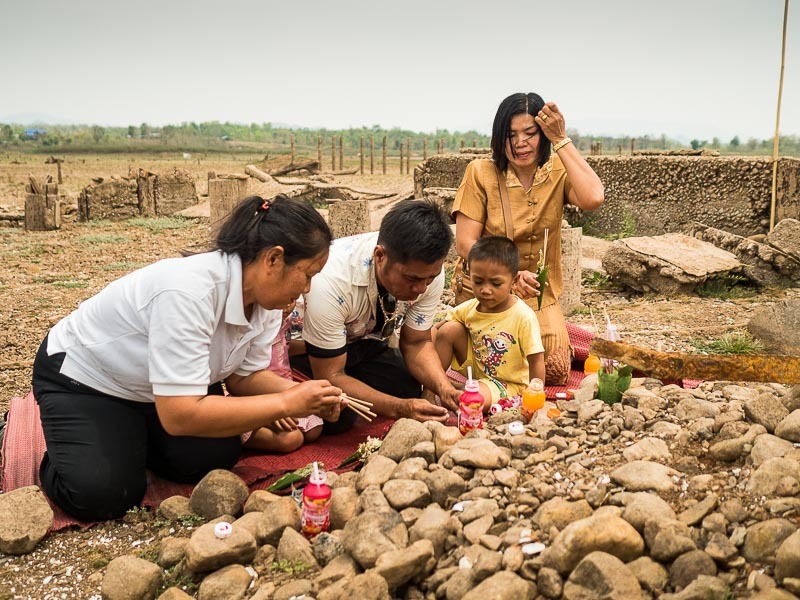 A family prays in the ruins of the temple. They came to see the old temple. The floor of the reservoir is cracked and dessicated, much like drought ravaged areas in the United States or Australia. The people's houses are gone - the small wooden huts didn't stand up to the ravages of time. But the foundations of the old temple, some of the pilings of the monks' quarters (all homes are built on stilts in this part of Thailand) and the foundations of some of the older public buildings are still visible. A well is all that remains in this part of the village. There is still water in the well. 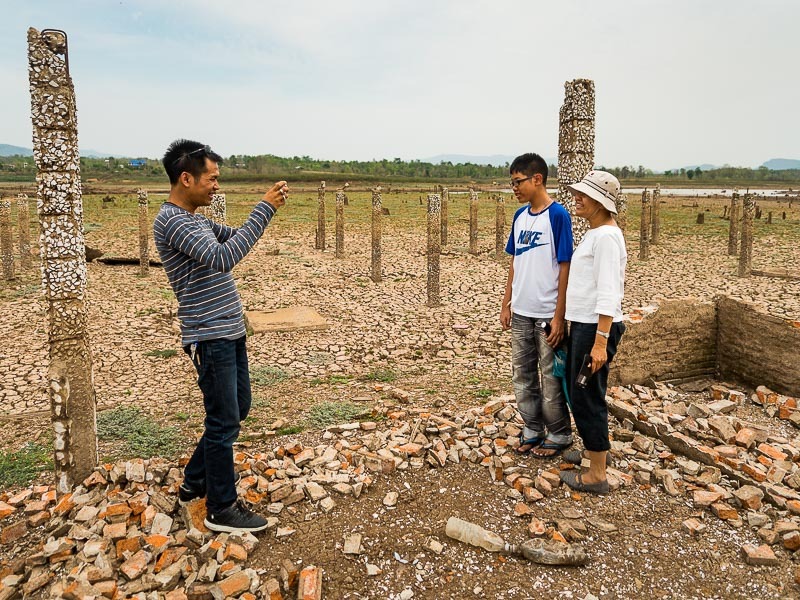 A family of tourists take pictures in one of the old public buildings. An old villager told me it was the community clinic, another said it was some other government office. The empty reservoir is the most visible sign of the drought but the crisis extends well into the countryside. Farmers are feeding their animals rice straw they salvage from the fields. The rice straw is not as nutritious as grass but many of the pastures are withering and there isn't much grass left. There isn't enough water for crops and those are withering. A farmer collects rice straw for his water buffalo in a paddy near the reservoir. Farmers are supposed to start planting rice in June or July, depending on the start of the rainy season. If the rains don't come, they won't be able to plant rice. There is enough rice stored in community warehouses to get through to October and November, when rice is harvested. 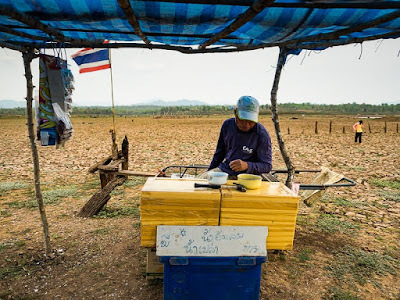 But if it doesn't rain, rice won't be planted and at that point Thailand could be looking at food shortages in the countryside. 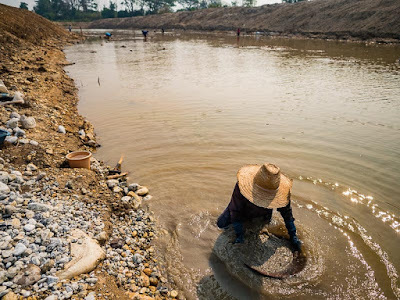 A little north of Mae Chang, in Wang Nuea, people pan for gold in the Wang River. 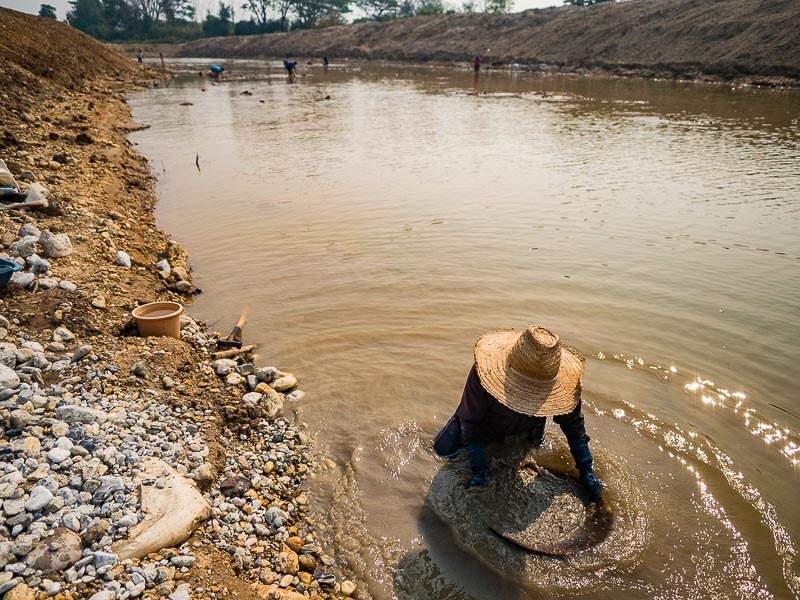 A man pans for gold in the Wang River. I visited Wang Nuea a couple of years ago and hundreds of people were panning in the river. This year there were only five or six people panning for gold because the river was dry except for a few feet of water in a temporary reservoir being built by the government. But there's no water left up or downstream from the reservoir. The Wang River feeds into the Chao Phraya River, which provides water for central Thailand and Bangkok. If the Wang runs completely dry (a tiny amount of water is flowing into the Wang from tributary streams as it meanders south) there will be less water for the Chao Phraya and Bangkok. One of the other rivers feeding the Chao Phraya, the Yom River, is expected to run completely dry by the end of April. 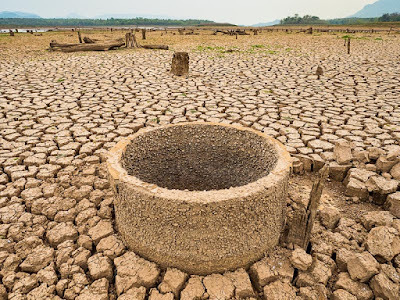 If it runs dry that means less water for the Chao Phraya and Bangkok. I can't help but feel Thailand is on the verge of a catastrophic crisis. Because we are already in a water deficit, I think it's going to take more than a normal rainy season to completely replenish the reservoirs and water system. If we get a below normal rainy season, the deficit and crisis will grow much worse.